The official weigh-ins for “UFC 121: Lesnar vs. Velasquez” takes place today outside the Honda Center in Anaheim, California. Stream Friday’s weight contest live right here on 5thRound.com starting at 5PM ET/2PM PT. If you happen to be wondering aimlessly around The OC, today’s festivities are free and open to the public. 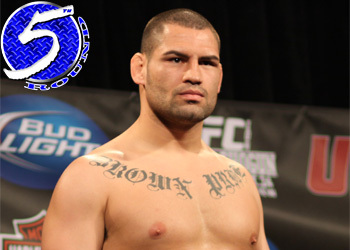 Saturday’s heavily hyped event features a blockbuster heavyweight scrap between champ Brock Lesnar and Cain Velasquez. The challenger owns a perfect 8-0 record and is arguably the Lesnar’s toughest test to date. However, the same was said about Shane Carwin before the former WWE superstar handed him his first professional blemish at UFC 116. Due to Lesnar’s “Brocktober” status, Jake Shields’ Octagon debut hasn’t received the fanfare it deserves. The former Strikeforce middleweight king will be dropping a division to face the ever dangerous Martin Kampmann in a 170-pound affair.